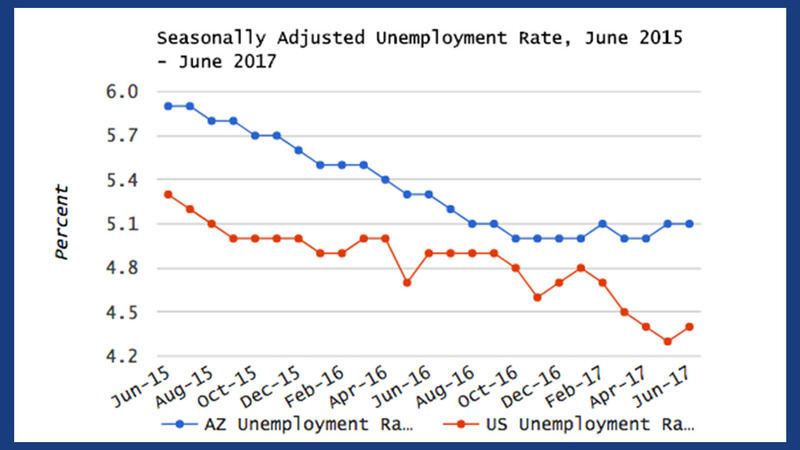 / Modified jul 21, 2017 10:01 a.m.
A monthly report from the Arizona Office of Economic Opportunity shows the state's unemployment rate stayed flat in June, at 5.1 percent. In contrast, the number of jobs in the state dropped by 42,800 last month. Such a number may appear bad, but it is actually expected during the summer. “Those were almost entirely seasonal jobs related to government, education, and leisure and hospitality. These are typical losses,” said state Research Administrator Doug Walls. Walls said the losses are better than expected. Since the recession ended, June has averaged 53,100 jobs lost. Summer seasonal losses were most felt in the Tucson area, where month-to-month employment numbers fell by 2.8 percent. While Tucson's month-to-month losses were written off as seasonal by Walls, the year-to-year growth in jobs was not. Tucson's job market has grown by 0.5 percent in the past year, the lowest of any of the seven metro areas measured in the report. “However, we are seeing positive growth in several industries within Tucson, including manufacturing, health care, and financial activities over the year,” he said. Jobs in those fields, according to Walls, often come with higher salaries and are a sign of solid economic growth. MORE: Arizona, Business, Pima County, Economy, Jobs, News, Tucson, U.S.